Every organization has a history. And we do, too. But nothing captures the beginnings, the journey, and the vision of Kenya USA Diaspora Sacco better than the powerful and authentic opening speech that Frank Kioko, the current Chairman, presented during the historical launch of the first ever Diaspora Sacco for Kenyans. ……..the registration of this Sacco brings with it a huge investment opportunity for us here in the Diaspora, and a big economic boost to our country. For about six years now I have been involved in helping Kenyans invest their money back home through various banks and financial institutions. The banks have tried their best to help Kenyans in the diaspora, but their best has not met our financial and investments expectations. Even though banks have done their best to help us, there still exists a great need, and an enormous outcry among Diaspora Kenyans to have access to more promising and more affordable financing options. Every day I meet and talk to Kenyans who want to invest in Kenya, but cannot get the financing they want due to strict lending requirements by the Kenyan banks and the discouragingly high interest rates offered. It was out of this need that the Sacco idea started forming onin my mind, and it was crystalized about a year ago when I met other Kenyans that had encountered similar problems. Together we started exploring ways of having our Sacco registered. Therefore this Sacco is born out of a need that is real and relevant to us, Kenyans living in the Diaspora, a need that we can relate to and identify with. We are so grateful that tonight we are gathered here to make history together as we celebrate the first Diaspora Sacco to ever be registered by Kenyan government to cater for the Kenyans abroad. Three years ago I talked to various Saccos to find out how they could admit the diaspora Kenyans into their membership, to enable themso that they could enjoy the benefits of the cooperative movement like the rest of the Kenyans. In 2010, we came close to working with Kenya bankers Sacco, but the issue of “common bond” was a major impediment. In 2011, a team of five talented Kenyans came together with a goal of finding out how to register a Sacco. In addition, we approached the Kenyan Ambassador to the United States, H.E. Elkanah Odembo, who referred us to the CIC Group Executive Chairman, Mr. Nelson Kuria. Through various discussions we were successful in registering the Sacco through the Ministry of Cooperative Development and Marketing, becoming the first Kenyan E-Sacco, with its head office in Nairobi. After registration, we embarked on developing an E-Sacco system, which is an online system that meets the needs of all members regardless of their geographic location in the USA. The system will also offer convenience, ensure accountability, and track all member activities. 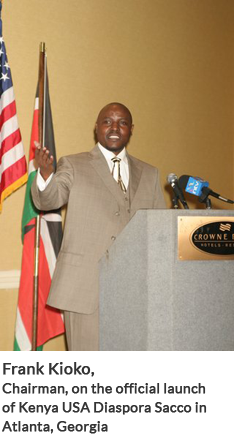 With the E-Sacco, USA Diasporians can register to become members from anywhere in the USA. We want to assure our current and potential members that there will be transparency, security, and high fidelity in handling member finances. 4. What is in it for you? It’ is our hope that the Kenya USA Diaspora Sacco will meet and exceed member expectations, and that it will become one of the largest, most successful, and well-run Saccos in the world.